← Meditation – how to do it, and how it will change your life. I love this recipe, it’s colorful, tasty and easy to make. The ingredients pack a powerful punch in the nutrition department. Butternut is filling, yet surprisingly low in calories ( just 45 cal per 100 g.) It contains no saturated fats or cholesterol, and is a rich source of dietary fiber. 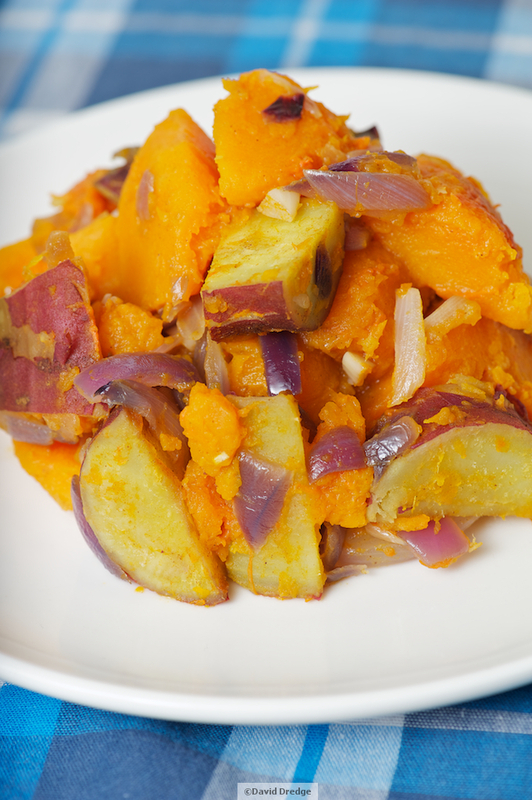 Sweet potatoes are rich in antioxidants and have a high vitamin A (immune system) content. They make the perfect pair! Sweet and simple. 1. Cut and peel the butternut. Pre-boil the butternut and sweet potato. 2. In a pan or wok, saute the red onion and garlic in some olive oil for about 2 minutes. 3. Add the butternut and sweet potato to the onion and garlic. Lastly add a dash of cinnamon.